The Giants can be such a frustrating team to watch. They finished the season with a 9–7 record, and as is their style, that record included both impressive wins and ugly losses. And while they're hardly the only inconsistent team in the NFL, they're the rare mediocre team that, until the very end of the regular season, remained a threat to make a deep postseason run, if only because they've done that sort of thing before. Of course, they won't be making any miracle playoff runs this year: They needed help in Week 17 to earn a berth with their 9–7 record, and they didn't get it. And so now that it's over, here's a look back at the 2012 Giants season, with all sixteen games ranked in ascending order of how much they made us want to fling our remote control at the television in frustration. Not much to complain about here. Coming out of their bye week, the Giants' offense really clicked in a rout of the red-hot Packers. Not a whole lot to complain about here, either. An all-around strong effort on the road against a 4–1 San Francisco team. Despite injuries to some key offensive players, the Giants cruised thanks to big games from backups Andre Brown and Ramses Barden. Still no danger of remote-throwing. A big day for the Giants offense, though David Wilson's celebratory backflips made us a little nervous. This game wasn't particularly frustrating, but the scoreboard-watching that took place as it played out was. Freaking Bears. A week after a discouraging loss in Philadelphia that dropped them to 2–2, the Giants fell behind 14–0 within the game's first five minutes and trailed 17–7 before putting up twenty points in the final seven minutes of the second quarter to gain control. The Giants got their first look at Robert Griffin III, and his touchdown pass to Santana Moss gave Washington a lead with 1:32 remaining. Manning would save the day with a 77-yard touchdown pass to Victor Cruz on the Giants' next possession. Another game that required a fourth-quarter comeback from Manning and company. Tampa Bay took a fourteen-point lead early in the third quarter and led by eleven at the start of the fourth. The Giants rallied back to take a 34–27 lead with just under four minutes left ... and then the Bucs answered back with a 41-yard Mike Williams touchdown reception. The Giants would drive 85 yards in 1:27 to retake the lead, and the Bucs appeared to take the ball into the red zone on their next drive, but a Williams catch was ruled incomplete upon replay. This game was exhausting. We promised in October to never speak of this game again, so we won't get into the details. At least they won, right? This one would have been a lot harder to watch if it happened later in the season, but it was hard to get too worked up in Week 1 following a Super Bowl win. The Giants scored late to cut the Cowboys' lead to seven but never got the ball back. Losing to Dallas always stings, but there was still plenty of season left at this point. A sloppy Monday night effort in which the Giants took nine penalties, including one on a critical third-and-ten in the fourth quarter that negated what would have been an important first down. A back-and-forth final quarter ended with one of the most frustrating drives of the season. Down by two after an Eagles field goal, Eli Manning drove the Giants into Eagles territory, aided by a couple of Philadelphia pass-interference penalties. Needing only a field goal to win, they had second-and-nine at the Eagles' 26, but an offensive pass-interference penalty brought them back ten yards and, thanks in part to some questionable play calling, forced Lawrence Tynes to attempt a 54-yard field goal, which he missed. The Giants entered this game winners of four straight and went to the locker room up 14–10 after an eventful second quarter. But Eli Manning had one of the worst games of his career, and the Steelers rallied back from a ten-point deficit with a pair of fourth-quarter touchdowns. Okay, maybe the Bengals (who entered this game at 3–5 but finished at 10–6) are better than we thought they were at this point in the season, but this was still an ugly game for the Giants. The problems began pretty much right away: Cincy opened the scoring with a 56-yard touchdown pass from Andy Dalton to A.J. Green some two and a half minutes into the game. 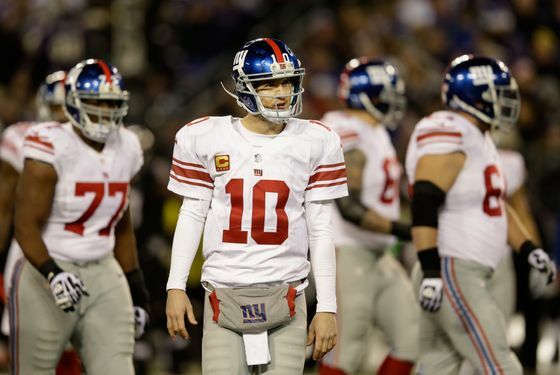 The Giants punted on their first possession, and that punt was returned 68 yards to the Giants eleven-yard line. The Bengals then needed just three plays to put the ball into the end zone again and extend their lead to 14–0. It's a real toss-up between these two games, but we think the Ravens game was more infuriating. The Falcons were on their way to the best record in the NFC, which makes such a thorough beating marginally easier to accept. The Ravens, on the other hand, were playoff-bound by this point but appeared vulnerable: They'd lost three in a row heading into Week 16. This was the game in which the Giants lost control of their own playoff destiny, and to watch that slip away as the Ravens targeted Corey Webster on seemingly every offensive play was pretty depressing. And, of course, the Baltimore game was made all the worse by what happened against the Falcons the week before: Getting embarrassed in Atlanta was bad enough, but the thing about these Giants is there's always the chance they'll turn things around, even if it requires a win against a tough opponent. That didn't happen in Week 16, and it wasn't even close.